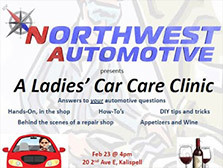 A hands-on, open discussion, about common vehicle care. Ever had a question about your car, but felt uncomfortable asking it? Here is your chance! Learn maintenance tips and tricks in a warm, clean, judgement-free environment.